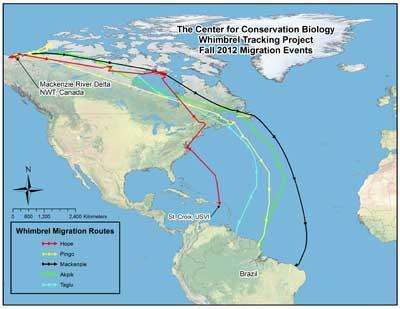 Fall 2012 migratory routes of whimbrels tagged by researchers with the Center for Conservation Biology and partners. Map shows the long distance over ocean flights that whimbrels (and other shorebirds) are capable of. As they traveled from the east coast of Canada to the northern shore of South America, Akpik, Mackenzie, Pingo and Taglu stunned researchers and the global conservation community by flying some 2,500 miles out to sea, through the heart of the Atlantic Ocean, a migration route that has never before been documented. The nonstop flight was quite a feat, especially for a medium-sized shorebird that cannot land on water. For one bird, the journey took 145 hours, or approximately six days, and a distance of 4,355 miles. The four birds, known as whimbrels, are part of a conservation initiative being led by scientists at the College of William and Mary/Virginia Commonwealth University Center for Conservation Biology at the VCU Rice Center, aimed at learning more about the migratory pathways and habits of whimbrels. The tracking work is being conducted with conservation partners from the United States and Canada. 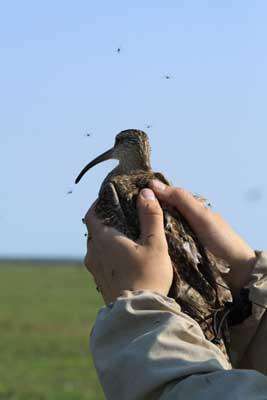 The team has tracked more than 20 whimbrels since the spring of 2008 as part of a broader tracking project. Each bird has been fitted with either a 5- or 9.5-gram satellite transmitter that has generated a significant amount of data giving researchers more information about the annual cycle of the species and what routes it uses to migrate. The broader tracking project is a collaborative effort between the Center for Conservation Biology, the Nature Conservancy, the U.S. Fish and Wildlife Service, the Canadian Wildlife Service, Georgia Department of Natural Resources, Manomet Center for Conservation Sciences and the Virginia Coastal Zone Management Program. Earlier this month, thanks to those satellite tags, the team observed something never before observed during the bird's migration from the north to their wintering grounds in South America. 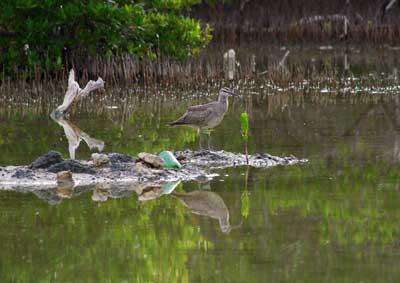 “Hope” the whimbrel in Great Pond, US Virgin Islands, shortly after she arrived on the island Sept. 4, 2012. Image courtesy of Lisa Yntema. "This is a bird that does not land on water, so flying 2,500 miles out to sea is quite a risk suggesting that there is likely some benefit for taking that risk," said Bryan Watts, Ph.D., director of the CCB, who has been studying these birds for nearly 20 years. "It could be tail winds or a reduction in the likelihood of encountering a destructive storm. Before this year, we simply did not know or suspect that they would migrate that far out to sea," he said. Whimbrels are about the size of a crow and have a long down-turned bill and long legs, all of which make them appear larger than they are. In Virginia and the southern states, they feed on fiddler crabs and marine worms – and there is plenty to go around. Virginia serves as a pit stop and staging area. "Virginia plays a critical role for this species," Watts said. "It is a terminal staging area, meaning that it is the last place along their spring migration route where they refuel before making the long flight to the breeding grounds in the Arctic. Productivity there is likely influenced by their condition when they leave here. "Virginia needs to send them north in good condition in order for them to produce enough chicks. We believe that we are doing that." But, according to Watts, since the mid-1990s, the whimbrel population migrating along the western Atlantic coast has declined by 50 percent. "It is not known with certainty what is causing the population decline seen in whimbrels. In order to find out why the whimbrel numbers are declining, we need to know where it is spending its time and what hazards it might be facing," said Watts. "We have no reason to believe that the problem is here in Virginia since there seems to be plenty of fiddler crabs to go around. But the two birds that we tracked last fall that were shot on Guadeloupe has highlighted the possible connection between hunting in other countries and the decline," he said. Watts said that poor conditions or hunting on the wintering grounds would influence adult mortality, and poor conditions on the breeding grounds may reduce productivity. It is also possible that climate change is causing a shift in conditions on their arctic breeding grounds, he added. Last fall, the team was tracking whimbrels Goshen and Machi when the birds were shot on the Caribbean island of Guadeloupe by hunters. The same team of scientists noted that Goshen and Machi – who were migrating separately – had both stopped on the island after encountering different tropical storm systems. According to the researchers, several isolated mangrove swamps serve to concentrate shorebirds for shooting and an estimated 3,000 hunters participate in the shorebird hunt annually. "Taglu" the whimbrel ready for release. Image courtesy of Lisa Pirie/Canadian Wildlife Service. Wondering how the birds in this study were named? The incident had significant impact on the global conservation community and awareness of the issue bloomed. According to the CCB researchers, stories about the incident were published in at least seven languages in approximately 10 countries worldwide. Approximately a dozen bird conservation groups sent letters to the Ministry of Environment on Guadeloupe, as well as the French Overseas Department, the governing body of Guadeloupe. Because it is not known how many shorebirds are taken during these hunts and there are no regulations for these shooting parties, the relationship between hunting and ongoing population declines is difficult to study. However, the connection between hunting and the downturn in the whimbrel population is being explored by researchers. By learning more about this bird, the hope is to collect information that will lend to the long-term conservation of this population. "We find this species fascinating and hope that the public will feel that way too," Watts said. "I think that the public in many parts of the world can identify with the struggles that these birds face to survive and reproduce." More information: Read the Whimbrel Fall 2012 Migration Log. Read What's in a Name? Did nt read anything in the article about those Whimbrels living or traveling on the west coast of the US. I have recently seen & photographed some feeding along with Marbled Godwits on a Pacific Ocean beach near San Francisco. Thanks for more info if available.